My son George has recently become obsessed, I mean OBSESSED with pancakes! Every morning my little four year old gets out his stool in the kitchen, gets the bowls and baking ingredients and we make pancakes together. Sounds idillic and picture perfect doesn’t it? …batter is spilling out of the bowls..
…and because we always add chocolate chips, there are about just as many chocolate chips in the batter as they are in little tummies, actually probably more in tummies. My morning routine is pretty chaotic at the best of times with two little high-energy boys, but now it is at a whole other level. It reminds me of one Christmas when a friend posted on Facebook perfect photos of her making gingerbread men with her children. The kitchen was perfectly clean, the gingerbread men had perfect physiques and their icing was spot on. Well, George and I attempted gingerbread men that year. I didn’t post a photo on Facebook. We (read: my toddler) dropped a bag of flour on the ground, the first batch literally melted because we may have forgotten one or two ingredients, the final batch of gingerbread men were missing limbs and some even missing heads, and the icing looked more like they had been in a snowball fight than wearing fancy Christmas attire. We love cooking together, my boys and I, but it’s a serious commitment on my behalf and usually ends in me having a wine (or whiskey). Getting back to the pancakes, despite trying many a recipe George will only eat my Fluffy Buttermilk Pancakes, that was until I snuck a little buckwheat into them. I did it at first to make them a little more nutritious but turns out they taste even better. The buckwheat gives them a delicious nuttiness and very slight caramel flavour. My toddler loves them and so do I. I usually only go half buckwheat flour and half plain, but if you like a more strong buckwheat flavour you can go all out buckwheat. 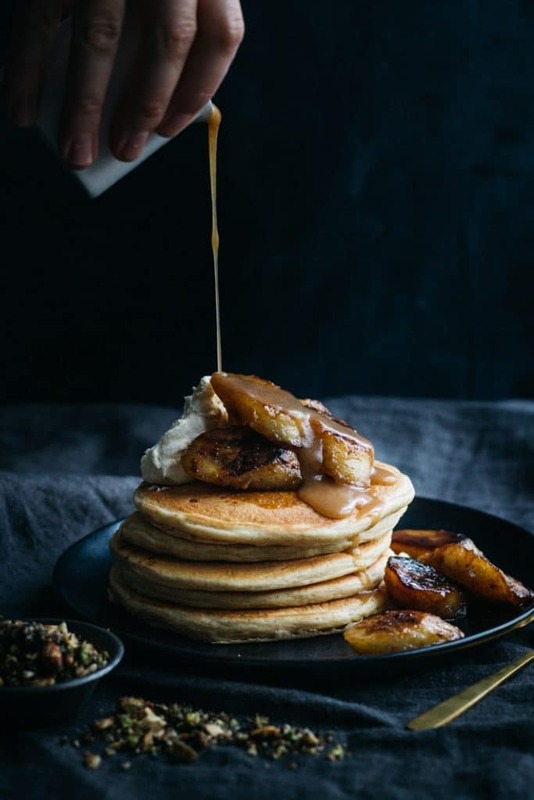 Although we are making pancakes everyday at the moment, these ones with caramelised bananas and sweet Dukkah are currently reserved for the weekend when I have time. Pancakes on a week day are already giving me too many grey hairs, don’t want to add more! When you caramelise the bananas they go all toasted on the outside and super sweet and plump on the inside. They are then drenched in the most delicious buttery maple caramel sauce. Try to use slightly under ripe bananas which will keep their shape better, but any old banana will taste great just the ripe ones don’t look as pretty and go a little mushy. 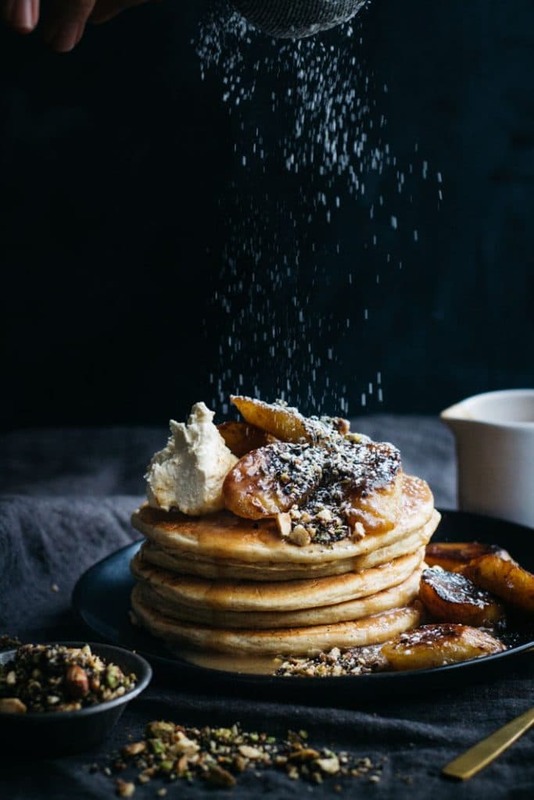 Lastly, top off that big stack of pancakes and bananas with buttery caramel running down the sides with some crunchy, nutty sweet Dukkah. Delicious nuts and sesame seeds toasted with sweet maple syrup and a pinch of salt. 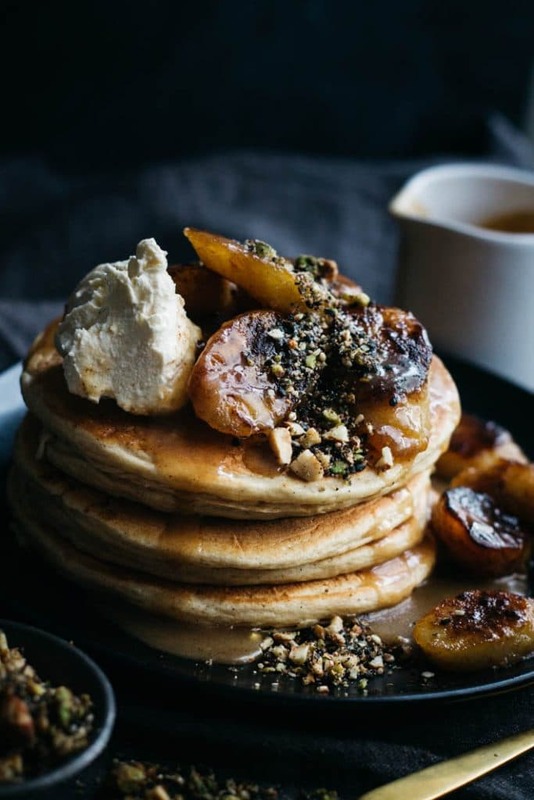 So good on these pancakes and because you’ll have plenty of leftover Dukkah from this recipe, also so good sprinkled over poached fruit, with natural yoghurt and honey, on your morning porridge, sprinkled over ice cream or to add a little crunch to the top of your french toast. Enjoy and I hope your kitchen is a little less chaotic than mine! 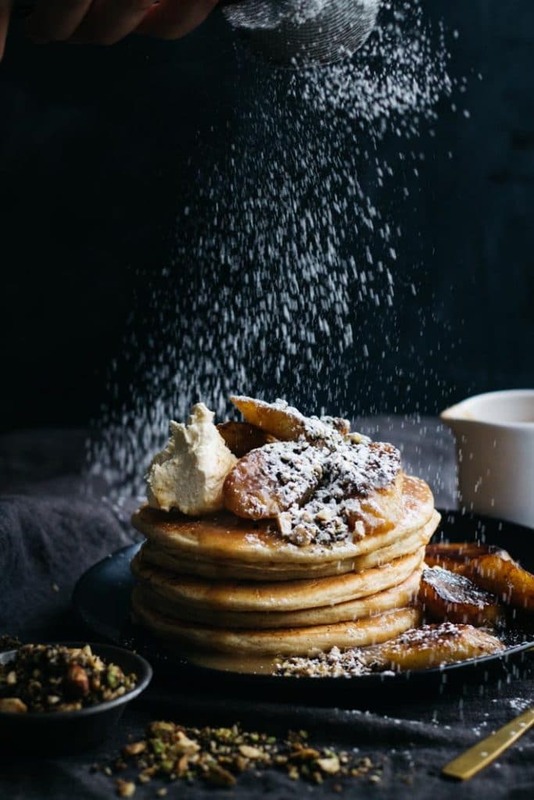 These pancakes are fluffy and have a delicious nutty and almost caramel flavour from buckwheat flour. They are topped with sweet bananas caramelised in butter and maple syrup and scattered with crunchy sweet Dukkah. All refined sugar free and perfect for your next weekend brunch! Preheat oven to 200C/400F on fan bake. Line a baking tray with baking (parchment) paper. In a medium bowl, mix together pistachios, hazelnuts, almonds, sesame seeds, cinnamon and salt. Drizzle with olive oil then toss to coat. Spread out nuts and seeds over the baking tray then place in the oven to toast for 4 min. Remove from oven and drizzle over 1 Tbsp maple syrup. Toss to coat then spread out again over the baking tray. Place back in the oven for 5-7 min until toasted and you can smell the aroma of the nuts and seeds. Be careful to keep a close watch to ensure the Dukkah doesn’t burn. Remove from oven and allow to cool. The Dukkah will harden as it cools. Once cool, transfer Dukkah to a food processor and pulse until roughly chopped. Store any unused Dukkah in an air tight container for up to a week. In a medium bowl, whisk together the dry ingredients. In a separate bowl mix together the wet ingredients. Add the wet ingredients to the dry ingredients and mix to combine. There will be some lumps but don't worry, your pancakes will not be lumpy. Set aside. Warm a skillet, griddle pan or fry pan over medium heat (see note). Add approximately 1 tsp butter (enough to grease the pan). Using a soup ladle, spoon in one ladle full of pancake mixture into the pan. Leave for approximately 5 minutes or until you start to see bubbles popping on the surface of the pancake. Turn over and cook for a further 2-3 minutes until golden brown. Depending on your pan size, you may be able to cook more than one pancake at a time. Repeat for remaining mixture. Makes approximately 8 pancakes. Keep warm while you make the caramelised bananas. In a medium sized fry pan over medium heat melt 1 Tbsp of butter, reserve the remaining butter. 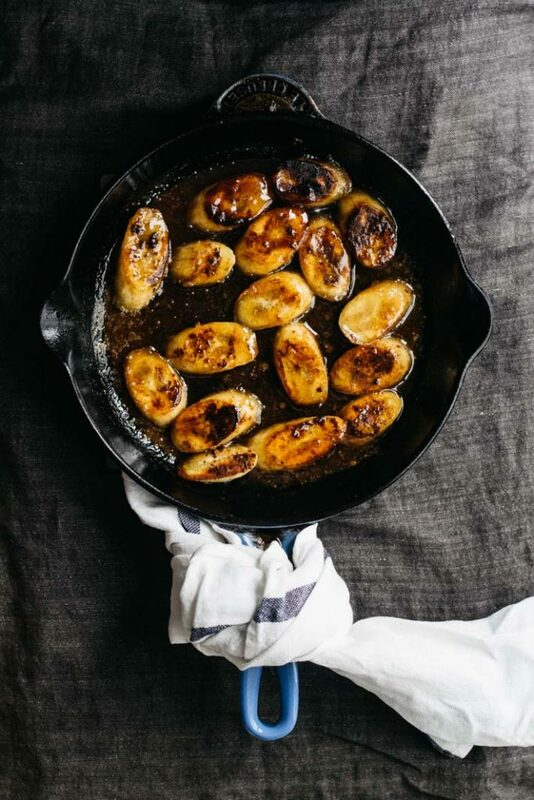 Place the bananas in a single layer in the fry pan and fry until browning on the bottom, 3-5 min. Turn over. Add remaining butter scattered around the pan, maple syrup and vanilla to the pan. Sprinkle over cinnamon and continue to cook until the syrup is bubbling and bananas are plump. Remove from heat. 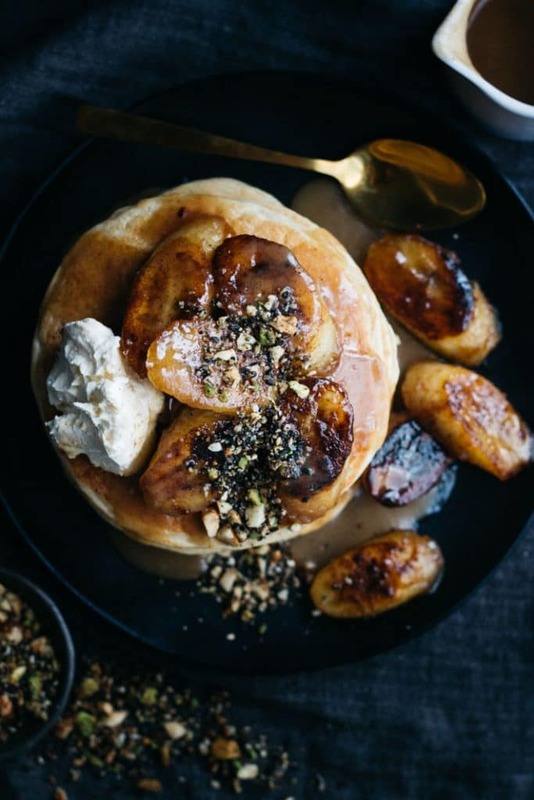 Top pancakes with slices of banana, dollop of mascarpone or yoghurt, a drizzle of syrup and a scattering of Dukkah. Serve immediately. 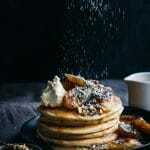 This recipe for Sweet Dukkah makes far more than you need for this pancake recipe. Use the leftovers for sprinkling on poached fruit, with natural yoghurt and honey, on your morning porridge, sprinkled over ice cream or to add a little crunch to the top of your french toast. I actually have started making my pancakes on the bottom of my sandwich press. I keep it open and use the bottom of it like a fry pan. You don’t need any butter and it makes the most perfect, evenly cooked pancakes I’ve ever had. Just be sure you don’t have one of those sandwich presses with ridges on it! Your post has had me in stitches 😂. I was always the kid that wanted to make cakes and biscuits, only to turn the kitchen into a disaster zone for my poor mum to clear up! And I can still manage to destroy my kitchen on a daily basis! These pancakes sound so good. I’ve never tried buckwheat in pancakes before so these are going on the list for breakfast on my next lot of days off! And that sweet Dukkah…. Yes! You were destined to become a food blogger James! Yes, I can’t solely blame George, I am a bit like you and my kitchen is destroyed on a regular basis. A friend on mine put me onto buckwheat in baking and it adds a really nice nutty flavour – just don’t put to much! I made the mistake while experimenting with making some muffins and they were a little to ‘healthy’ tasting. Thanks so much Dawn! Definitely a great way to start the morning and put you in a good mood for the rest of the day! I just wanted to say that I love the style of the food photography in this post. I think the dark photography style is definitely underrated, these pictures look delicious! Thank you so much Minela! I definitely think my photography is a work in progress and I have a looooong way to go. I love the dark look too! I love your gingerbread men story! Your sons will have such fond memories of being in the kitchen with their mom when they get older. These pancakes look amazing!! I’m not a huge breakfast person, but what a treat to start the morning off with these gorgeous pancakes! Your photos are stunning too! Pinning. I hope so! I think their favourite memories will be licking the bowl and spoon though! Thank you so much for your lovely comment, I really struggle with my photography so your comment just put such a big smile on my face!